With Secret Escapes, there will be no need to avoid luxury accommodation or exotic destinations because you’re put off by the extravagant price tag. Back in 2012, Secret Escapes took the world by storm with their extraordinary low prices on premium vacations. What’s the secret you may ask? Secret Escapes hand-selects hotels around the world and works alongside suppliers to create exclusive deals for its members. You can guarantee that you won’t find a better price online so you can shop with peace of mind that you won’t need to compromise on luxury because of your budget. Wherever your heart desires and whatever you want to discover, you’ll be able to travel for so much less with Secret Escapes. Discover so much more than your typical holiday retailer - enjoy luxury dining options, stylish rooms, fun-filled activities for all to enjoy like golf or yoga, snorkelling or sight-seeing. It’s not just luxury holidays you can find her either, enjoy Spa Breaks or retreats in the UK, seaside getaways or City shopping trips. From London to Bali, Mexico or even Thailand, find holidays suited for families, friends and couples - Everyone at Secret Escapes can enjoy the quality and relaxation they deserve at a price they can afford. At Secret Escapes, visiting the Magnificent, UK’s Capital, London is truly an experience you won’t find elsewhere. The expert team behind the scenes ensure that with your Secret Escapes package, you check into a hotel with a difference. Revel in the luxury, cool and chic surroundings of your impressive hotel that promises stunning views, brilliant locations, suave interior and everything you could need from your weekend pad. Take your pick from a selection of hand-selected hotels for less using one of NetVoucherCodes deals and enjoy peace of mind that your budget allows it. Discover the island life and enjoy hopping from island to island aboard a Royal Caribbean Cruise - just one of Secret Escape proud partners. Revel in the white beaches of St Lucia one day and be exploring the secluded bays of Antigua the next. Whether you’re looking for warm waters, palm trees and dreamy beach or vibrant culture, sightseeing and island rhythms - find it all on a Caribbean Cruise. It’s all about getting the most out of your money with Royal Caribbean Cruises which offer all-inclusive deluxe drinks plus a half-price fare when you buy one with Secret Escapes. If you’re searching for the hotel of your dreams in a destination you’ve never been to, you’re likely to find it with Secret Escapes. If you’re in the mood for a last-minute getaway or you’re planning your next summer vacation - whatever the occasion, Secret Escapes have got you covered. Using one of our Secret Escapes Voucher Codes could help your next luxurious getaway be cheaper than you think. 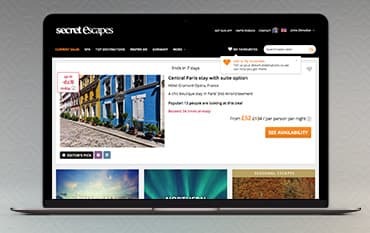 From UK spa breaks to exotic long-haul vacations to exotic locations across the globe, see what secret deals you can grab at Secret Escapes. We are constantly on the hunt for Voucher Codes for Secret Escapes to help you with your money saving. Our experts check dozens of sites for secret codes including NHS discounts, student sites & social media channels saving you time & money!